Everyone knows that birds descended from dinosaurs — and, like dinosaurs, birds have been subject to the kinds of ecological pressures (loss of habitat, climate change, human predation) that can render a species extinct. Here's a list of the 10 most notable birds that have gone extinct in historical times, in descending order of disappearance. Known to European settlers as the Prairie Pigeon, the Eskimo Curlew was a small, inoffensive bird that had the misfortune of migrating in a single, gigantic flock from Alaska and western Canada down to Argentina, via the western United States, and back again. The Eskimo Curlew got it coming and going: during the migration north, American hunters could pick off dozens of birds with a single shotgun blast, while Canadians pounced on the fattened-up birds before they embarked on their return trip south. The last confirmed sighting of the Eskimo Curlew was about 40 years ago. The only parakeet ever to be indigenous to the United States, the Carolina Parakeet wasn't hunted for food, but rather for fashion — this bird's colorful feathers were prized accessories for women's hats. Many Carolina Parakeets were also kept as pets, effectively removing them from the breeding population, while others were hunted as sheer nuisances because they tended to feed on newly planted crops. The last known Carolina Parakeet died at the Cincinnati Zoo in 1918. There were various unconfirmed sightings over the next few decades. In its heyday, the Passenger Pigeon was the most populous bird in the world. Its vast flocks had billions of birds and literally darkened the skies over North America during their annual migrations. Hunted and harassed by the millions — and shipped in railroad cars, by the ton, to the starving cities of the eastern seaboard — the Passenger Pigeon dwindled before vanishing by the late 19th century. The last known Passenger Pigeon, who was named Martha, died in captivity at the Cincinnati Zoo in 1914. The fourth bird on our list, the flightless, mouse-sized Stephens Island Wren, lived way Down Under in New Zealand. When the first aboriginal human settlers arrived to the island nation about 10,000 years ago, this bird was forced to decamp to Stephens Island, two miles off the coast. There, the wren persisted in blissful isolation until the 1890s, when an English lighthouse-building expedition unwittingly unleashed its pet cats. The furry pets quickly hunted the Stephens Island Wren to complete extinction. The extinction of the Great Auk (genus name Pinguinus) was a long, drawn-out affair. Human settlers started munching on this 10-pound bird about 2,000 years ago, but the last surviving specimens only went extinct in the mid-19th century. Once a common sight on the shores and islands of the North Atlantic, including Canada, Iceland, Greenland, and parts of Scandinavia, the Great Auk had a sadly familiar failing: having never seen human beings before, it didn't know enough to run away from them rather than waddle up and try to make friends. You might think a 12-foot, 600-pound bird would be well-equipped to withstand the depredations of human hunters. Unfortunately, the Giant Moa was also cursed with an unusually small brain for its size and spent countless eons in a New Zealand habitat completely devoid of any predators. When the first humans arrived on New Zealand, they not only speared and roasted this enormous bird, but they also stole its eggs, one of which could presumably provide a breakfast buffet for an entire village. The last Giant Moa sighting was well over 200 years ago. The island of Madagascar is much bigger than the island chain of New Zealand, but that didn't make life any easier for its large, flightless birds. Exhibit A is Aepyornis, the Elephant Bird, a 10-foot, 500-pound behemoth that was not only hunted to extinction by human settlers (the last specimen died about 300 years ago) but succumbed to diseases carried by rats. By the way, Aepyornis earned its nickname not because it was as big as an elephant, but because according to local myth, it was big enough to carry off a baby elephant. 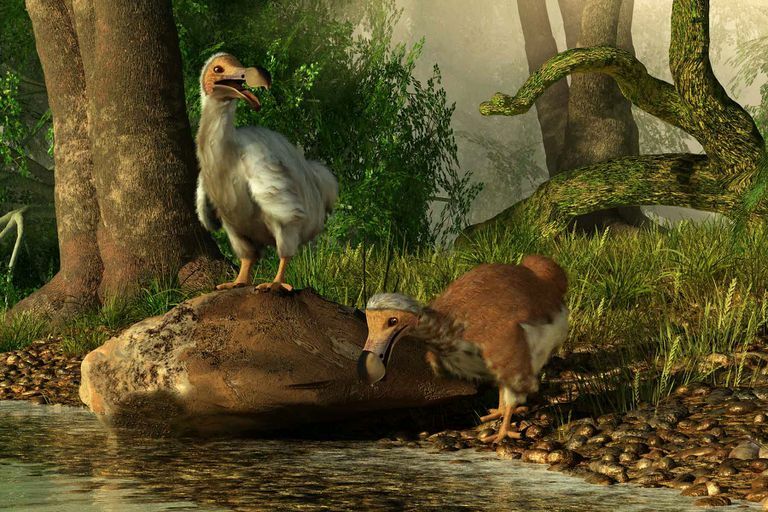 You may be surprised to find the Dodo Bird so far down on this list, but the fact is that this plump, flightless bird went extinct nearly 500 years ago, making it ancient history in recent evolutionary terms. Descended from a flock of wayward pigeons, the Dodo Bird lived for thousands of years on the Indian Ocean island of Mauritius, only to be slaughtered in short order by hungry Dutch colonists who landed on this island and went searching for something to eat. By the way, "Dodo" probably derives from the Dutch word "dodoor, meaning "sluggard." It has probably dawned on you by now that if you're a large, flightless bird looking to have a long and happy life, it's not a good idea to live in New Zealand. Emeus, the Eastern Moa, was relatively petite (6 feet, 200 pounds) compared to the Giant Moa, but it met the same unhappy fate after human settlers hunted it to extinction. Although it was presumably lighter and nimbler than its more fearsome cousin, the Eastern Moa was also burdened with comically oversized feet, which made running away not a viable option. The Moa-Nalo's story closely parallels that of the Dodo Bird: millions of years ago, a gaggle of lucky ducks floated all the way out to the Hawaiian islands, where they evolved into flightless, thick-legged, 15-pound birds. Fast forward an eon or so to about 1,200 years ago, and the Moa-Nalo found itself easy pickings for the first human settlers. Not only did the Moa-Nalo disappear off the face of the Earth a millennium ago, but it was completely unknown to modern science until various fossil specimens were discovered in the early 1980s.